A systematic EbA planning method has been developed and applied based on the Open Standards for the Practice of Conservation. Within this method, identified dependencies and vulnerabilities, climate change information, and planning as well as monitoring of measures build on each other in a logical way. EbA measures have been applied in Central Asia before, but without systematic identification, often neglecting relevant climate information, which could even lead to maladaptation. Tajikistan (I)NDCs: contribution to full-scale integration of the climate resilience and adaptation measures into planning and development of the various sectors/areas. Implemented through dissemination of knowledge and experience on climate change at various levels. Kazakhstan (I)NDCs: contribution to the transition to a «Green» Economy, under which government programs on […] and conservation of ecosystems and enhancement of forest cover were adopted.Kyrgyzstan (I)NDCs: contribution to the implementation of adaptation actions in several vulnerable sectors, including Water resources, Agriculture, Forest and Biodiversity, in oder to reduce economic losses. The policy approach to natural resource management in Central Asia still follows a top down approach, which will not be able provide localized and tailored solutions to the negative impacts of climate change. Local government structures are not equipped with sufficient financial resources and often lack capacities in order to create comprehensive management plans that incorporate climate information. 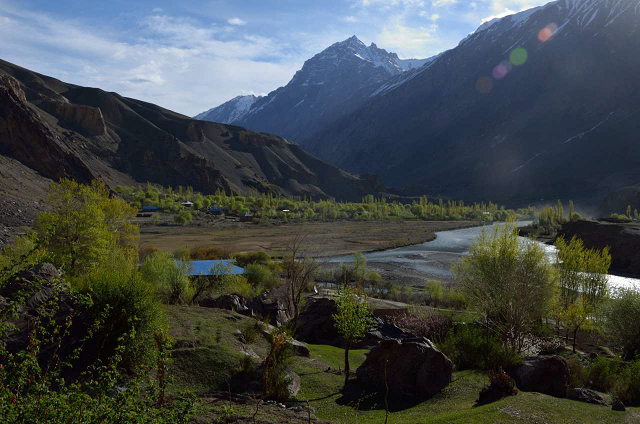 The diverse ecosystems in the high mountainous regions of Central Asia provide essential goods and services, such as clean water, forest products, protection against natural disasters. However, inappropriate land management practices coupled with climate change impacts pose a severe threat to the sensitive ecosystems and have already led to increasing degradation. The EbA method outlined here helps to overcome these problems with an integrated approach that also takes Capacity Development into account. Climate information and nature based solutions help people to adapt to climate change. BB 1 represents the EbA method comprising a full-fledged vulnerability assessment and is based on the Open Standards for the Practice of Conservation. It analyses the current and desired state of ecosystems and conventional as well as climate change related vulnerabilities of people and ecosystems. The outcome is an overall adaptation strategy incl. EbA measures. BB2 combines capacity building, institutionalizing and making available climate risk information to local development planners to pave the way to come from a project to a process. Together with local communities, innovative processes of climate change adaptation planning have been launched. The participatory application of the method provided clarity to local stakeholders on the potential conventional and climate change related threats as well as adaptive capacities of local communities and ecosystems towards current and long-term climate change trends. It allowed to identify the most promising adaptation options robust to different climate scenarios, primarily focusing on improved pasture and forest management as well as water conservation measures. Additionally, households have been introduced to alternative income opportunities, such as tourism and fruit processing. The level of knowledge of local authorities, specialists of public sector institutions, and the local population about climate change issues and the need to adapt with nature-based solutions has been improved through communication and environmental education. The capacity of village institutions has been strengthened to flexibly plan the management of natural resources and make decisions on conservation and restoration of biodiversity. Local authorities and village institutions are now familiar with the features of decision-making under a changing climate (scenario planning). These joint measures will enable residents of high mountainous regions to better adapt to climate change.